San Francisco has its fair share of street performers, none of them as infamous as Bushman. 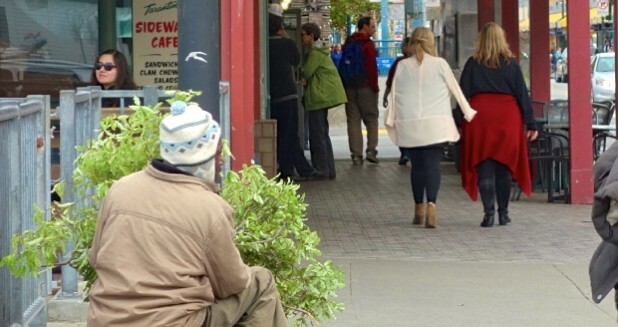 The famed Bushman is a homeless person who scares people from behind a bush. He’s known around the world for his antics. And if you’re not alert while you walk through Fisherman’s Wharf, you might take home lasting memories of him too. The key to finding Bushman is to look for the eucalyptus branches. Usually crouched behind them, he waits for the perfect moment to jump out, particularly when the sights and sounds of Fisherman’s Wharf distract people. He then pops out, and with a slight growl and movement of his branches, typically frightens passersby. Although you might flinch, jump or make a weird face or embarrassing noise, it’s only polite to put a dollar in his tip jar. It’s too easy for Bushman. Even when a crowd loiters to watch, which you can do once you donate a dollar, it’s simple for him. The look of Fisherman’s Wharf is just too engaging for the first-time San Francisco traveler. Nobody really pays attention to a small bush, let alone knows a homeless man is lurking behind it. He’s gotten so good at scaring people, he’s become an attraction himself! Most people agree the original Bushman is David Johnson. But others argue the first was Greg Jacobs who, sadly, died recently. Since then, another Bushman has taken Jacob’s place. Just like in business, a creative idea is copied and tried to improve on by several people. No matter which Bushman you come across, they’ll be down on Jefferson Street, especially if the weather is nice. Only in San Francisco, you might say, could a homeless man earn a living jumping out of a bush. Bluntly, the first Bushman took a simple but creative idea and made it profitable. When you visit San Francisco and walk through Fisherman’s Wharf, don’t be afraid to look for him, lest he find you first. Any tips or comments? Let us know!